Not long after our epic trip in Mexico, we felt the urge to get out and see some more of China. A little clever re-scheduling at work gave us three full days off in a row, and thanks to the quickly developing high-speed rail network of China, we set out to cover two cities- Luoyang and Xi’an – in that short time. Seeing as how there was really only one thing we wanted to see in each city, we figured it was feasible. Our trip began with an overnight train ride from Beijing to Luoyang, an ancient city in central China’s Henan province. A former Imperial capital of China, Luoyang is a city rich in Chinese history and culture. We checked into the Yijia youth hostel – the only one in town – and relaxed for a bit before heading out to explore. 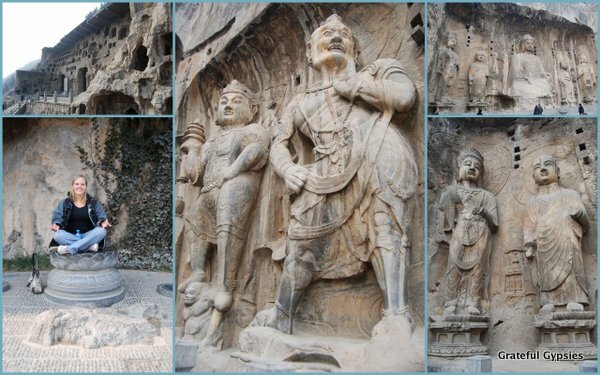 A collage of the amazing Longmen Grottoes. With only one full day to spend there, we went straight to the main attraction – the Longmen Grottoes. Situated on the banks of the Yi River, the grottoes are one of the best examples of Chinese Buddhist art. Here, you’ll find thousands upon thousands of intricate Buddha images carved out of the stone in a series of caves. Construction began here way back in 493 when Emperor Xiaowen moved his capital to Luoyang, and it continued for over 400 years through successive dynasties. It truly is a sight to behold, and visiting it has been hands down one of our most inspiring cultural outings in China. The Xiangshan Temple and Chiang Kai-shek’s villa. There’s more to see here than just the carvings, though. 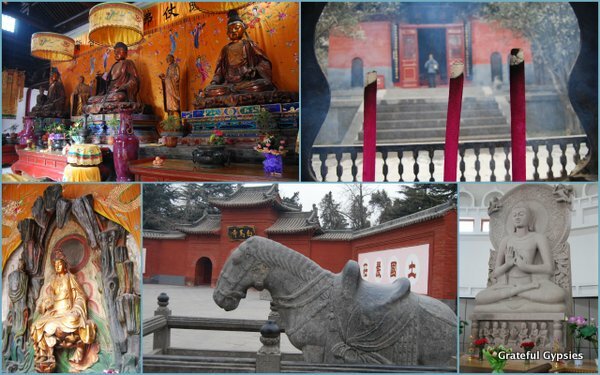 The tomb of Tang Dynasty poet Bai Juyi is also here, as well as a handful of temples. We visited the Xiangshan Temple, where you’ll also find a villa where Kuomintang leader Chiang Kai-shek once lived for a short time. 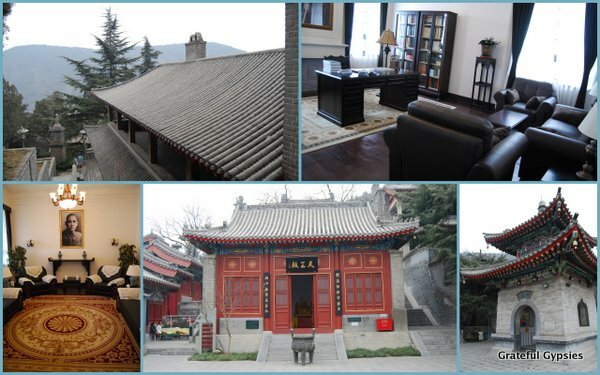 The inside of the villa has been renovated and now features plenty of photos of him along with a KMT flag – something surprising to see in China. Back in the city, we did our usual travel routine of wandering around aimlessly in search of something interesting or tasty. 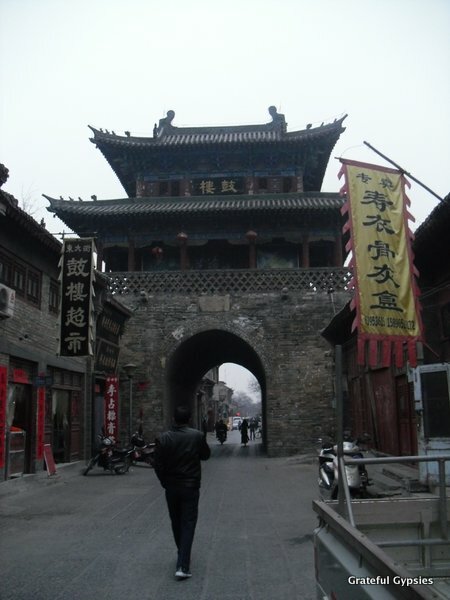 Around the old Drum Tower, we strolled through the old neighborhoods of Luoyang, watching daily life go by. Just like most other places in China, there were bustling street markets going on, and most people looked a bit shocked and confused at the sight of two lao wai. We found a decent looking restaurant and sat down for some cold veggies, hot noodles, and lukewarm beer – a typical Chinese meal. The old Drum Tower of Luoyang. In the evening, we walked across the street to the People’s Square (something just about every city in China has), where we found locals gathered around a massive TV screen watching the daily news, playing cards, or simply chatting and drinking tea. These evening gatherings are one of our favorite things to do in China, as there is absolutely nothing touristy about them; this is the way local people get together and enjoy their free time. Instead of trying to understand the Chinese news, we decided to join in a group of middle-aged ladies for their dance routine. They were happy to show us the steps, and there were big smiles all around as we danced to Chinese pop tunes. Street vendor selling chicken sandwiches right outside of KFC. 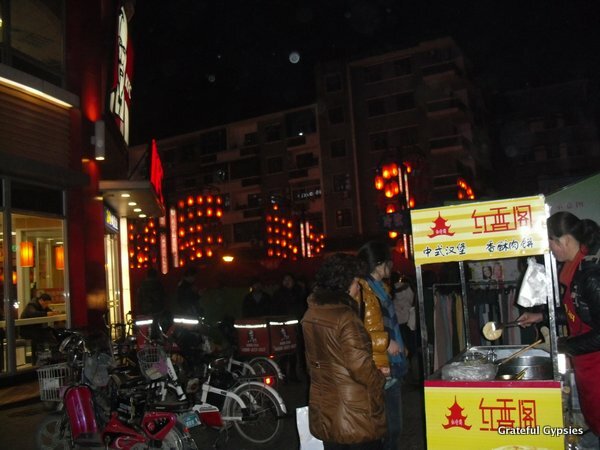 Trying the street food is another activity we love when traveling in China, and we found plenty of it in Luoyang, with a whole block of the city bathed in red lanterns and full of smoke off the grill. We got some street beers (because you can) and tried some delicious local snacks. In a typically TIC moment, we couldn’t help but laugh when we spotted street vendors selling homemade chicken sandwiches directly in front of a KFC. This type of thing would never fly back in the US, but hey, TIC (This Is China). The next day we didn’t have to catch our train until the afternoon, so we figured we’d try and squeeze in a visit to the White Horse Temple. As the legend goes, two monks brought a white horse with Buddhist figures on its back to Emperor Ming of the Eastern Han Dynasty. This was the first time Buddhism appeared in China, and the Emperor was so grateful that he ordered a monastery be built in honor of the monks. As the first Buddhist temple in China and one of the oldest in the entire world, it’s a very significant piece of history. We spent an hour or so walking around the temple grounds, until we had to rush out to catch our train. Keep this in mind should you choose to visit Luoyang – both the White Horse Temple and Longmen Grottoes are a little far out of the city center, and it being China, traffic can be horrendous going in and out. Thankfully, we got to the train station in time, where we jumped on the high-speed train bound for Xi’an. Explore Luoyang in this short video. While we enjoyed our short trip in Luoyang, we’ll be the first to admit that we rushed it. We much prefer traveling slowly, so we should have known better than to give only one day for a city. Although there isn’t a whole lot to do, simply wandering around the old neighborhood, eating street food, and dancing with the local ladies at night is a fun and relaxing way to enjoy your time in between seeing the big sights, and we definitely could have stayed for two or three days. 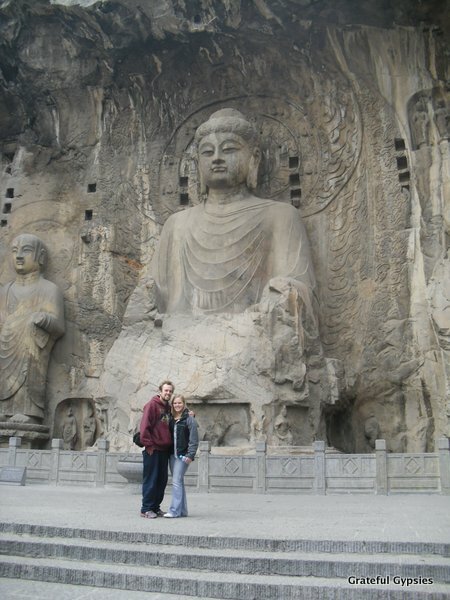 Dwarfed by the massive Buddha carving at the Longmen Grottoes. Transportation: There are fast trains that make the trip from Beijing West to Luoyang Longmen in just about 4 hours, and these only have seats – second-class cost 367 RMB, first-class are 587, and business class go for 1158. Alternatively, you can take the overnight train and get a hard sleeper for 200 RMB or soft sleeper for 300. Get Around: It’s easy to get around Luoyang by public bus. There are buses that run from the train station into the city center, and also out to the Grottoes and the White Horse Temple. Taxis are around, and are pretty cheap as well. Accommodation: We stayed at the only hostel in tow, Yijia. A double room was 100 RMB/night, and it was a good enough place to rest in between running around the city. The location is great for exploring the old city and also for catching the bus to and from the sights and train station. Activities: In terms of sightseeing, the major places to see are the Longmen Buddhist Grottoes and the White Horse Temple. Other than that, just hanging out in the old neighborhoods like a local is the best way to unwind. Food/Drink: There isn’t really any local specialty in Luoyang asides from some big banquet, so we opted instead for the usual cheap noodles and street food. We didn’t seek out any bars or nightlife here, but rather opted to drink street beers and wander around the night markets. Recommended Time: One day was too rushed here, so give yourself at least two. You could also extend the trip a few days by visiting Henan’s capital city of Zhengzhou, where you’ll find the famous Shaolin Temple.